American Dryer ExtremeAir CPC9-C Germ Killing, High-Speed Hand Dryer - Cold Plasma Clean Technology proven to KILL GERMS: E.coli, Salmonella, Influenza, Staph, C.diff and MRSA. Steel Satin Chrome Finish Cover. The ExtremeAir CPC is adjustable for the environment in which it's being installed, adapts to multiple voltages and has a sleek, compact design. The Cold Plasma Generator, available only inside select American Dryer ExtremeAir� models, uses steady-state positive and negative discharge points to split water molecules in the air into oppositely charged hydrogen and oxygen ions. These ions then break down gases to harmless compounds commonly found in the atmosphere. HEPA filters, the solution used by some manufacturers, may trap microbes, but cannot eliminate them. Nor do the filters clean the air surrounding the hands the way CPC does. 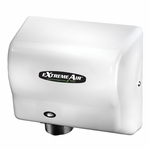 ExtremeAir is the most hygienic method of hand drying ever!